After the first of the year 2014, I’ve noticed a rise in requests for murals. 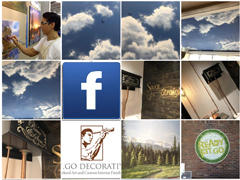 It’s been fantastic to see so many people appreciating the use of murals in their home and business. Kids room requests are still the most dominant, but business murals are close behind, and sky mural requests are a close third. With the launch of my new sculptural tree murals, I have a feeling that those requests will become much more frequent. I have some cool variations in mind for those. See a sample of the first design here: Sculptural Tree Murals. This upswing in requests is obviously exciting for me. The reason I create artwork, is to create mood. When the customer gets to enjoy the finished artwork for the first time, that joy is the entire reason I create art.